Abandonment in My Holy Will is the wings in order to fly together with my Will. As abandonment ceases, the soul loses the flight and the wings are destroyed. 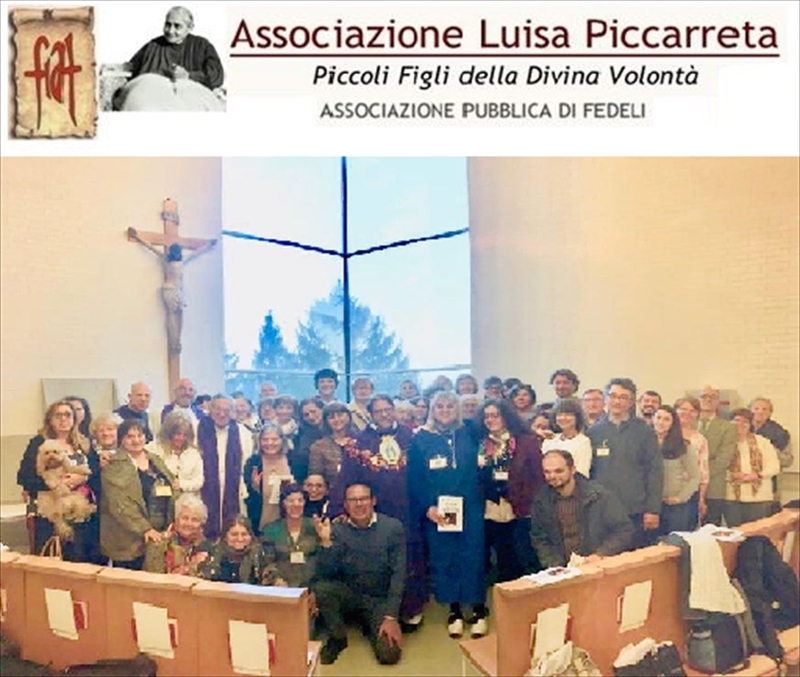 Sunday March 31, 2019 in Alba (CN), Altavilla, in the Diocesan House for Spiritual Exercises, a meeting was held for the Groups of the Divine Will of Piedmont. We were about 70 brothers and sisters from Alba, Turin, Cuneo and Vercelli. It was a very significant fraternal meeting that was led by Don Marco. Through the meditations of this year Don Marco imparted to us once again the joy of living in the Divine Will which means realizing the Kingdom of God on earth as it is in heaven. The Kingdom of God is not only in our midst but within us through the charism of living in the Divine Will of Jesus, which Jesus Himself wanted to give to Luisa Piccarreta and through her to the whole Church. The Divine Will is the Sanctity of sanctities that is realized when we succeed in living as God lives, through the nourishment of the precious knowledge of the 36 Books of Heaven. Don Marco highlighted that generally when we participate in a retreat we expect to receive a grace to draw on all that we need. Instead it is Jesus who asks us today: " Will you give me a drink " (Jn 4: 7) as He did with the Samaritan woman. Jesus says to you: " give me your soul, your life, your will, your heart, so I can give you my Heart!" This beginning was wonderful, in the awareness that Jesus puts His trust in us. We began that day in trust with one desire: to give Jesus a drink. Don Marco added that when we give Jesus a drink, Jesus will give us the hundredfold; but when we all go home more sanctified, we must also deal with the tests to be faced. This is the "kairòs". When we think that everything is bad, this is the right occasion in which God manifests himself in our life and surprises us. God intervenes and solves everything; as Saint Paul says: my power is made perfect in weakness (2 Cor 12: 9), and only if we live in Jesus, we can participate in His divine gifts. Jesus never disregards His promises! But how can this love and this divine life work in us? I still have in mind the words that living the Divine Will is nothing other than opening oneself to the experience of encountering God through the humanity of Jesus, who revealed to us that our life must be fulfilled according to His holy and adorable Will. So, what is the wonder of this journey of sanctification of living in the Divine Will? Jesus wants to pour the new wine into new bottles because He wants us to unite our human will with the Divine Will to do what He did when He was on earth, from His birth to His resurrection, repeating the divine acts that Jesus performed in His humanity. These acts are suspended and Jesus is waiting for us to make them our own and repeat them in our lives, bringing God's plan for humanity to fulfillment. Don Marco then spoke of Luisa's obedience, of the difference between doing and living the will of God. Resignation, total submission to the Will of God is the first step to be able to live in the Divine Will. We can therefore understand that living the Divine Will means to possess it. We pass from doing the Will of God, from resignation into total submission to His Will, and then arriving at a continuous state, being reborn from above (Jn 3.3: dialogue of Jesus with Nicodemus). We should let ourselves be taken by Jesus to become His "offspring", coming to realize that He does everything in us, because it is He who works in us. This is possible only if we deliver our human will to Him. The rebirth from above makes us new men and Jesus wants through the writings of Luisa to put the accent on the second part of the Our Father: as in heaven so on earth. Jesus wants us to do the Divine Will as well as the blessed who possess it in heaven. This is a foretaste of heaven. Life in the Divine Will is nothing but heaven already here on earth! And the extraordinary thing is that in order to do this, Jesus appeals to us, His little children, so that we can collaborate with Him for the building of His Kingdom by living united to His Will which becomes the Life of our life. In the afternoon the Eucharistic Adoration took place. We meditated on the last seven words of Jesus and we prayed the different passages of the hours of passion in which we repair our sins for ourselves and for all. When we meditate on the Hours of the Passion, Jesus lets His most precious blood descend upon our every concern that consequently disappears, because of what Jesus suffered for us and for all. Don Marco concluded the retreat, hand in hand with Mary Most Holy, telling us that we should be inspired by her who lived from the first moment of her conception in the Divine Will. We will therefore be able to understand the Divine Will only if we are profoundly "Marian", because in Mary there is the continuous exercise of life in the Divine Will. This makes me smile and I like to think about why our journey is continuing in the joy of the life of the Divine Will, because we have a very Marian spiritual father who dedicated our Radio to Santa Maria degli Angeli (by means of this radio it is possible to find the recordings of the meditations of this Retreat and many other teachings about the Divine Will). I was impressed by the meaning of the passage in Volume 16, February 2, 1924: " Each lack of abandonment in Me is a round that you lose in the sphere of Eternity. " But not a hair of your head will perish” if the Lord does not want it (see Lk 21, 17-18). In the Book of Heaven volume eight, January 30, 1909, the why of my Jesus is only one, and He gives an immediate and precise answer: Everything happens, everything continues, everything moves, everything is because the Will of God wants it and allows it. Fiat. All the meetings and Holy Masses during the Retreat, again this year, were animated by our dear Claudia and Maurizio, songwriters of the Divine Will, who made our soul rise in the sky by playing and singing. Before leaving we spoke to don Marco about some testimonies of healing that took place in our "Divine Will Cenacles", for the glory of God. Thank you Divine Will for this unforgettable day! How nice to be able to repair for us and for everyone! On behalf of all I make my own every word of the concluding prayer in the eternal will of God, for the triumph of the Divine Will in me and in all souls on earth as well as in heaven!